Chad Beguelin and Matthew Sklar on opening night of "The Prom"
These days? 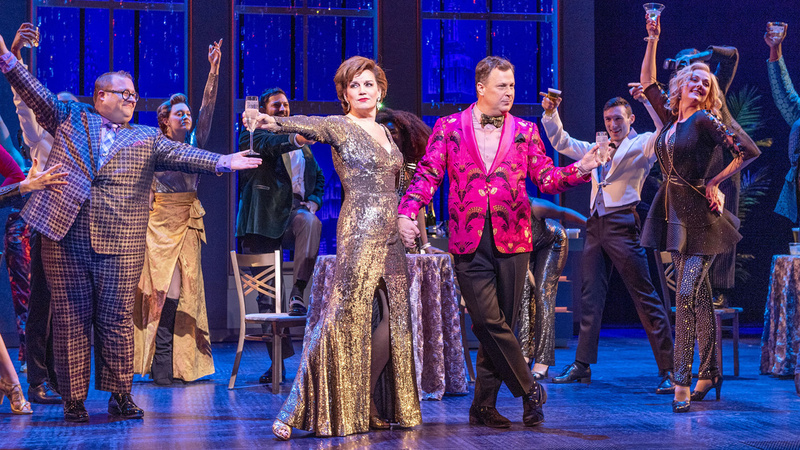 Not much is wrong for the Broadway favorites now basking in the best reviews of their careers for their joyful new musical comedy, The Prom, Broadway.com’s pick for the Best Show of 2018. The score is both a delicious throwback to the brassy sounds of classic musicals mixed with the catchy, thumping pop beats of radio hits. And the story, about a lesbian teen struggling with attention and Broadway stars thirsty to get attention, has hit a nerve with theatergoers. On the latest episode of Broadway.com Front Row, Editor-in-Chief Paul Wontorek catches up with the pair. Some highlights of the conversation are below. 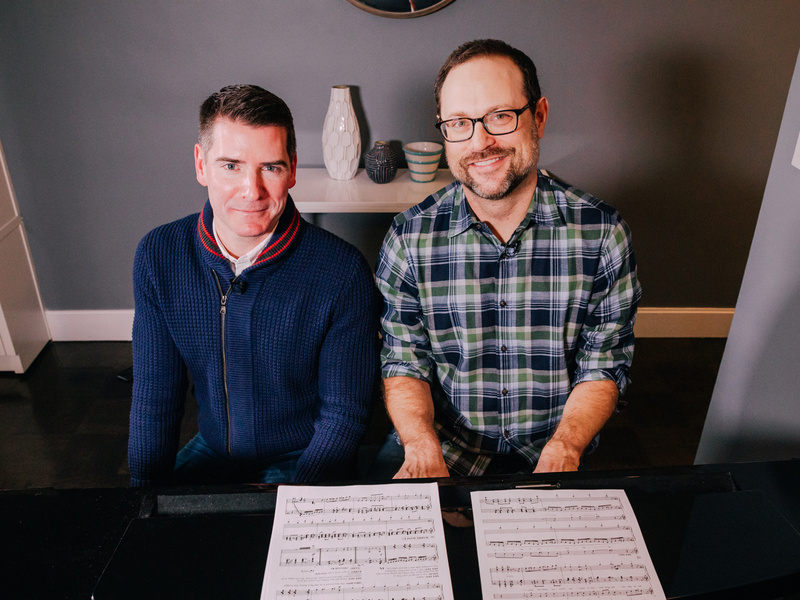 Beguelin and Sklar were paired up by Andrew Barrett, the literary manager of the now-defunct Musical Theater Works, a not-for-profit that helped develop new musicals. Barrett knew Sklar from his gigs in the pits of Broadway musicals—which he balanced with schoolwork at New York University—and he wrote Beguelin a “very nice rejection letter” when the young hopeful mailed him materials. After Beguelin pushed for a meeting, Barrett re-read his stuff and thought he might be a good partner for Sklar. They had a blind creative “date” at the Astor Riviera Diner on Astor Place, (which is, naturally, now a Starbucks) and hit if off. Challenged to write a musical in a few months, Beguelin and Sklar immediately got to work on an adaptation of Maurice, E.M. Forster’s famous gay novel, before realizing they couldn’t get the rights to the property. “And that’s when we went to the public domain of Sophocles,” Sklar laughs. Wicked City was next, an Oedipus-inspired campy musical noir set in the 1940s. Although the show has seen several regional productions, it wasn’t their ticket to Broadway. “We learned there’s not a big demand for musicals about banging your mom,” Beguelin jokes. Devastated but not defeated, Beguelin and Sklar doubled down on their commitment to their craft and found an exciting new project to embrace. Hairspray producers Margo Lion and Mark Kaufman of New Line Cinema hired them to adapt The Wedding Singer for the stage. Jazz tunes were out and ‘80s electro pop was in! Helping to lead the charge of brand-name movies titles making the leap to the stage, The Wedding Singer opened on April 27, 2006 at the Al Hirschfeld Theatre. Just two weeks later, Beguelin and Sklar were nominated for a Tony Award for Best Original Score with Beguelin also garnering a nomination for Best Book, two of five nods for the show including Best Musical. Although The Wedding Singer only ran for eight months, many productions around the country and world have followed and Kaufman immediately hired them to adapt Elf for the stage, one of the first projects for his new role as head of Warner Bros. Theatre Ventures. 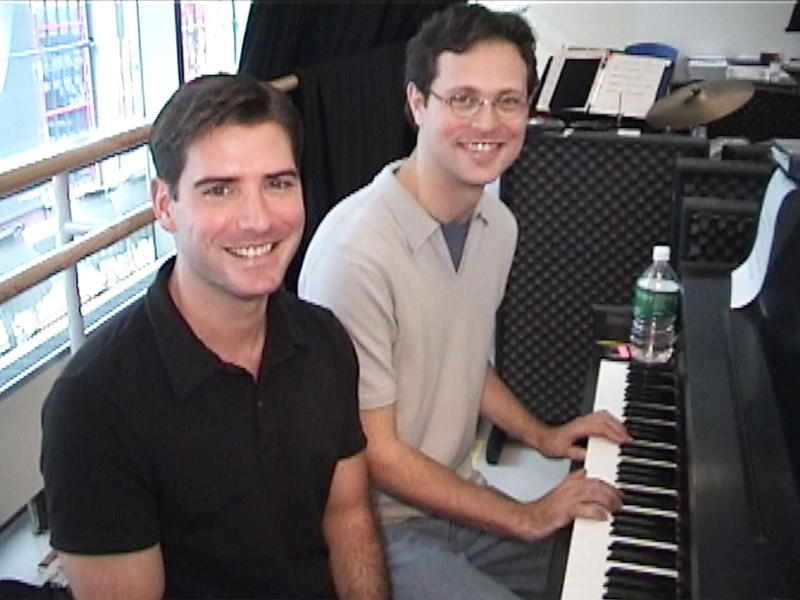 Find out more about Chad Beguelin and Matthew Sklar (and see them sing from The Prom!) in the full Front Row segment below. A new musical comedy about big Broadway stars, a small town, and a love that unites them all.